Inbound marketing advocates have a phrase that a person is more likely to get struck by lightening than click on a paid advertisement. Clearly, current and future car buyers (and, dealerships) are taking their chances, as it was recently reported that Facebook paid ads are greasing the sales funnel for car dealerships. 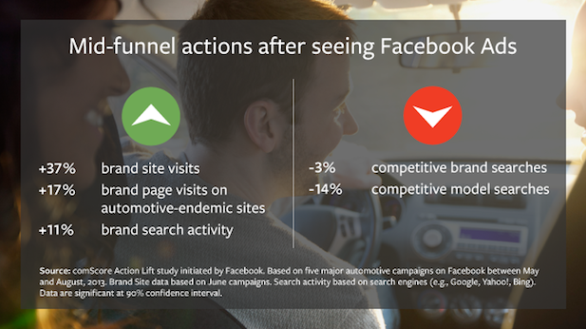 In a study performed by comScore Action Lift (initiated by Facebook) it was revealed that automotive campaigns that are run on Facebook DO influence people’s choices on brands. Further, the study showed that not only do these ads influence shoppers; it decreased the appeal of a competitor. This week at the Automotive News World Congress, Facebook’s head of automotive strategy, Kass Dawson will announce and discuss the results of the study. 37% visited a brand’s website. 17% brand page visits on automotive-endemic sites. 3% decrease in competitive brand searches. 14% decrease in competitive model searches. Does your dealership allocated money to paid advertisements? Is Facebook in the budget? How do you think these results compare to sponsored posts? Am I the only sucker who clicked on a Facebook ad? Click here to learn more about comScore’s findings.